Converted in 2006 and fully equipped centrally heated, 2 bedroom gite sleeping 4 adults or children, plus clic clac for additional 2 persons. Free Wifi. Exposed beams downstairs and pierre apparent walls with an enclosed fireplace for cosy evenings in winter (some wood provided) Private BBQ area and use of owners heated swimming pool 10 x 5 m and 1.8m deep - takes 5 or 6 adults children easily. Pool shared with the other gite, and is available May - September. (May be dependent on weather) Large garden shared with gite 1 with football area, childs swing table tennis and badminton. New for 2016 Childrens slide and Basket ball hoop. 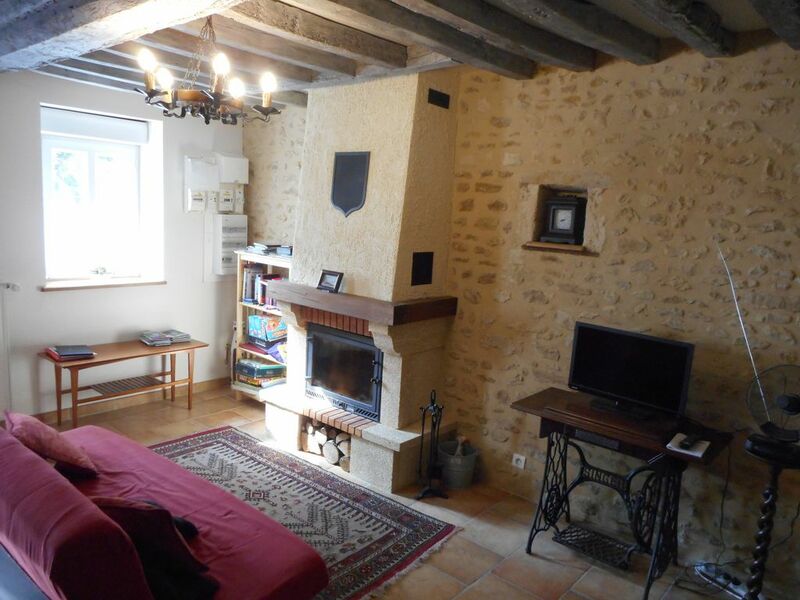 Situated in small village 10 miles from Mortagne au Perche, in quiet surroundings. Big Super U Supermarket 10 mins away. Owned by a British resident family - plenty of bird watching without moving from your front door, (lots of buzzards and even hoopoo) red squirrels, deer, fishing stocked lakes and rivers, and cycling (see Voie verte, cycle route Alencon - Mortagne) and forest walks. Also golf course (Belleme) within 15 miles, Alencon 20 miles. Flexible change over day to take advantage of cheaper midweek ferry fares, and possibility of extra days for example for those wanting a bit more than a week but not 2 weeks Ideal for winter lets as fully centrally heated and also wood burning fireplace in lounge gives cosy appeal. See also our other gite at this location 730811. Off road car parking is on site next to gite - for ease of loading unloading. Full Gas central heating and hot water. Upstairs. Double bedroom with 140cm bed seat and full ensuite shower, wc, washbasin. Shuttered window. Twin bedroom with twin beds suitable adult or children and ensuite shower and washbasin. Off landing area wc room. Outside; Private bbq area to front with table and 6 chairs and parasol, with barbecue and tools. Private parking, plenty of lawn, swing set, table tennis, volleyball and badminton net ( childs camping on request). Swimming pool (30 metres from gite) Tenants have use of owners private heated 10 metre pool open early May - end Sept equipped with sun loungers and parasols. The gite is in a small village of about 30 houses and 12 farms. Nearest town is Laleu with Bar restaurant Epicierie - a 20 minute stroll, and they even do take away meals. Also Ste Scolasse sur Sarthe with bar, grocers shop, post office, bakers, charcuterie and hair dresser (about 1.5 miles away). Largest town nearby Le Mele sur Sarthe (5 miles) with garage, pharmacy, hotels, banks, bars restaurants main post office and hotels plus many shops (inc english newspaper shop), supermarket and petrol. Visit our orchard to see where we grow our apples ( 4000 kilos in 2013!) to make cider and meet our friendly Ouessant sheep. They can be fed by hand! On arrival in the village there are no road names but will bring you to the centre next to the church - and our entry gates are just 5 metres across the road from the church. If you are travelling on the A28 from Calais or A88/A28 from Caen Falaise take the Sees exit. There is a new Sees bypass which will take you to the roundabout next to Auno sur Orne on the Mortagne road. DO NOT exit at the Gace junction which many GPS will try to make you do - it isnt easier believe us! main bedroom with full ensuite twin bedroom with shower room and wash basin separate wc room off landing area Hair dryer provided. Some DVD's in english mainly, and some childrens ones. Feel free to bring your own. Alan and Heather were the perfect hosts. Nothing too much trouble, but also not "in your face". Communication excellent and the travel tips beforehand were very welcome. Gite as described with everything that you would need. Don't be put off by the "shared" pool as there is loads of room for everyone. Hope to visit again. Highly recommended. Thanks for taking the time to review. We hope you enjoyed the rest of your holiday, and we would be delighted to see you all again sometime. We are also looking forward to seeing the British Puy de Fou. We have had a wonderful holiday in the Gite with our 2 grandchildren aged 13 and 9. So good in fact we stayed an extra night! Alan and Heather were excellent hosts and gave good advice on where to shop and local festivities. The Gite was extremely comfortable and well equipped with the added bonus of having 2 en-suite bedrooms. The pool was used every day of the holiday and the children loved feeding the miniature sheep in the orchard. Will return again when we have a longer driving holiday through France. Glad you enjoyed yourselves. We look forward to seeing you again anytime, with or without grandchildren! Thanks for your kind review, we always try to please. We enjoyed our first holiday at Alan and Heather's gite so much we returned for our second year! Once again it was wonderful to switch off from all the stress of work and truly relax. We explored the local towns and markets and also took a day trip to Le Mont St Michel. We had some very wet days this year which meant we were able to cosy up in front of a roaring fire, bliss! Alan and Heather are wonderful people, always ready with information about the local area and what is going on which may be of interest. We look forward to returning again. We have just returned from a wonderfully relaxing two week stay at this beautiful gite. It is in a rural area of Normandy within easy reach of lots of lovely villages, the locals were very friendly and patient especially when my rusty school french was called into action! The information folder and Alan & Heather's knowledge about the local area was invaluable ensuring we got to lots of local markets and a beautiful Chateau with a moat. The pool was fantastic keeping 3 'kids' (20, 16 & 13) entertained. What we wanted was a relaxing, refreshing, calming holiday and that is exactly what we got. We would recommend this gite without hesitation and hope to return ourselves in the near future. My wife and I had ten days at this lovely Gite. It was very relaxing and we had great weather too. The pool was welcome after days exploring the lovely lower Normandy area. Highly recommended and it was great to visit the nearby bar at Lalieu village with Heather and Alan. Advice where to visit was helpful and we explored a variety of things, culture, art, chateau, small towns, footpaths, local produce and market days. Our host provided a bottle of their cider on arrival and we were made very welcome for the whole of our stay. Lakes with leisure facilities open summer - 5 and 10 miles away. Horse riding and full tuition at several centres, 1 and 6 miles. Forest walks and birdwatching - large buzzards a regular sight overhead, harriers and hoopoes also seen along with red squirrels and other natural fauna and flora. Easy to visit the D Day beaches about 1.5 hours (Sword) or 2 hrs (Omaha Utah)drive away. Plenty of local markets available everyday of the week (more like UK farmers markets but with a french flair) Swimming pools with flumes etc 10 and 15 miles. Go kart track rally cross course (suitable children as well as bigger boys) 5 miles. Haras du Pin - is 20 minutes away, Montormel WW2 Falaise Pocket memorial 30 mins away. Le Mans 24 hr course and museum 50 miles. Golf courses 20 25 and 30 miles. Mont St Michel about 2.5 hrs away. Tennis courts in Le Mele s Sarthe. Mortagne au Perche, a walled medieval town 9 miles is the centre of the Boudin Noir (black pudding) festival Mid march. Le Mele sur Sarthe Percheron horse festival pony fair first weekend December. Other Activities: Go karting for adults and kids Essay circuit.